I’d been to Wales. 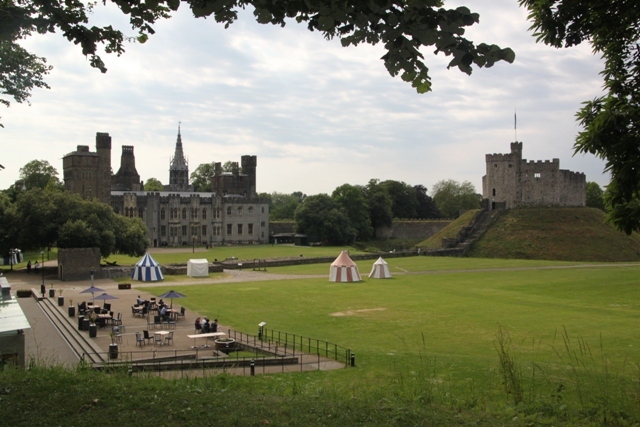 I’d been to three of the four UK capital cities, but until this summer I’d never been to Cardiff. Husband needed to venture to the south of Wales for work, an opportunity to see Cardiff and a weekend away was on the horizon. It was seized. 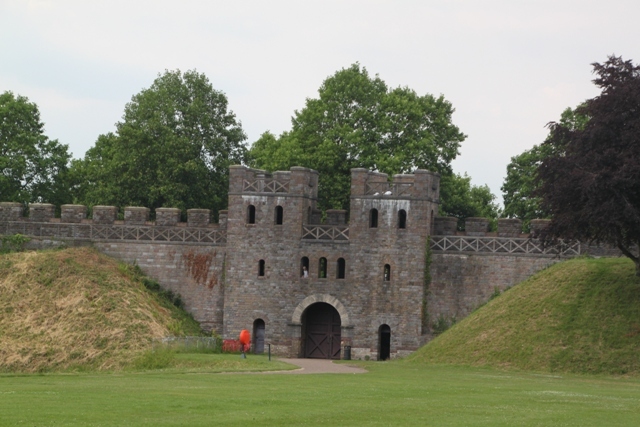 Top of the list of Cardiff’s attractions, I discovered, is its castle – that was our first stop. We found it easily – the whole of the city centre almost seems to be clustered around the castle walls. Donated to the city in 1947, before that it was the ancestral home of the Bute family. If you are a Cardiff resident entrance is free. If, like us you’re not, the entrance fee is more than reasonable. Inside was not what I expected and not how I expected a traditional Welsh castle to look. 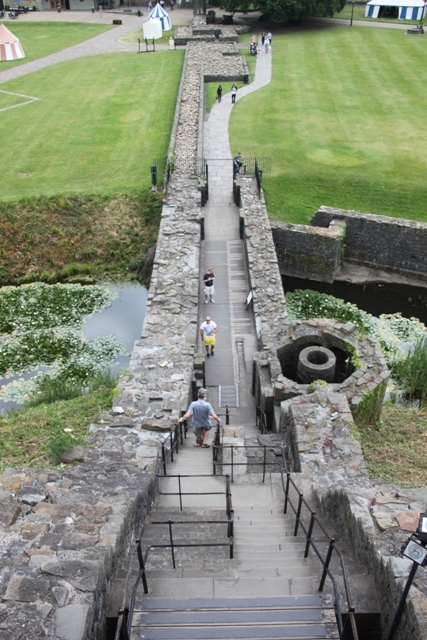 It is more like a collection of little castles centered around a green area and is spacious and lovely. Two thousand years of history to soak up – from the Norman motte and bailey shell keep built around 1081 to the 13th century Black Tower entrance gate, then there’s the fort where William the Conqueror’s eldest son was imprisoned by his brother and on top of all that the grandest of houses built in the 1420’s and made over by the Marquis of Bute in the 19th century. History galore. We headed first to “The Firing Line”, a small but well organised and interesting museum about Welsh regiments and soldiers. 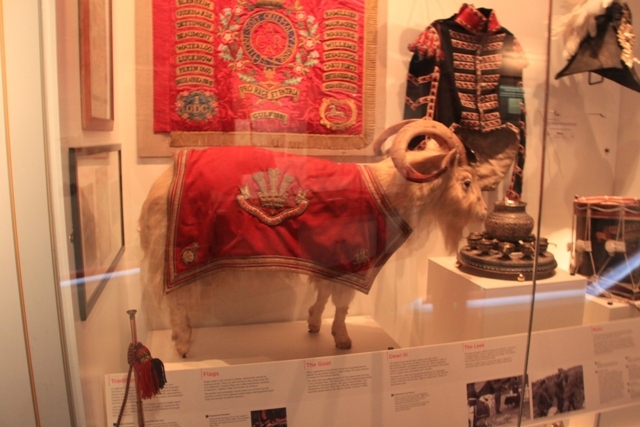 Most intriguing for me the Royal Welsh Fusiliers always have a regimental goat! We watched a film about the castle and its history, bit of a wow moment when the screen lifted up at the end to give a panoramic view over the central area outside. Time then for our guided tour – we paid £3 extra each for this and got a 50 minute guided tour of additional castle rooms you don’t see on the normal entrance ticket. Well worth the small extra charge, this was my castle highlight, our visit would have been incomplete without it. We got to see the living quarters of the third Marquis of Bute, the richest man in the world when he lived here in the 19th century. 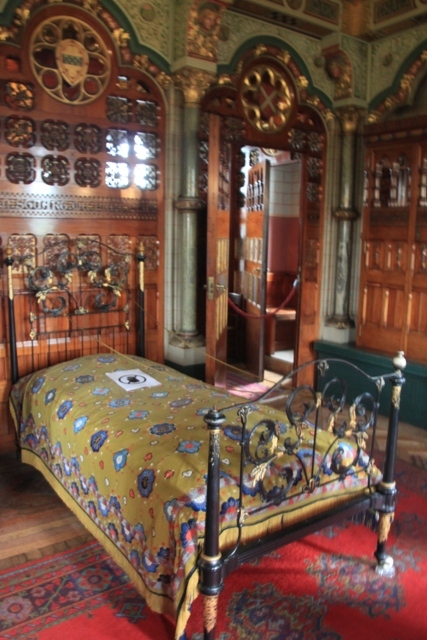 He lavished a significant sum on the castle and created, with the help of his eccentric architect William Burgess, a wildly flamboyant interior – it has to be seen to be believed. 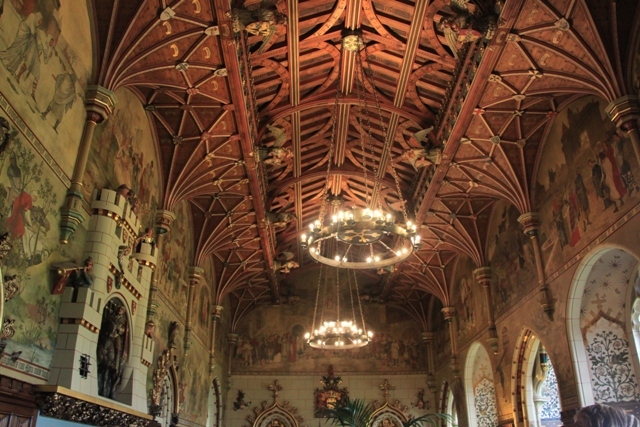 What a treat to wander with our guide through all the rooms – a Gothic fantasy made real. 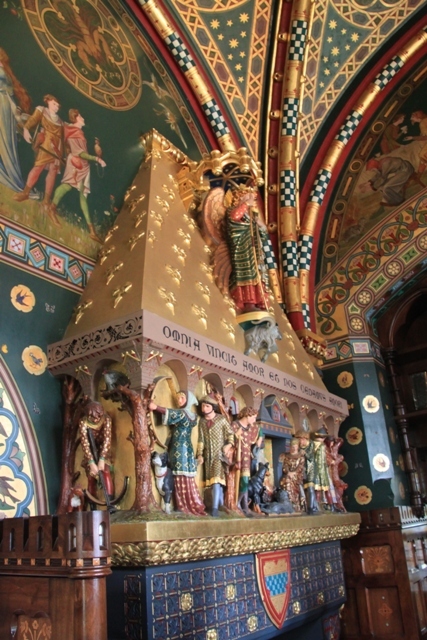 The whole place is stuffed to the rafters with Gothic architecture, religious symbolism and astrology symbols. 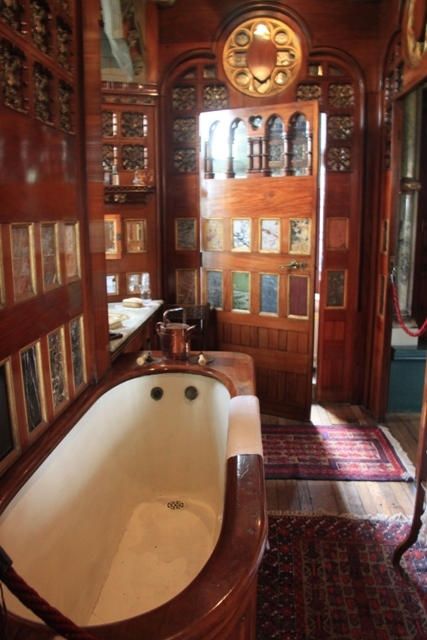 It also had all the mod cons of the Victorian era – this was the second house in Wales to have electricity and there was running water in the ensuite bathroom. 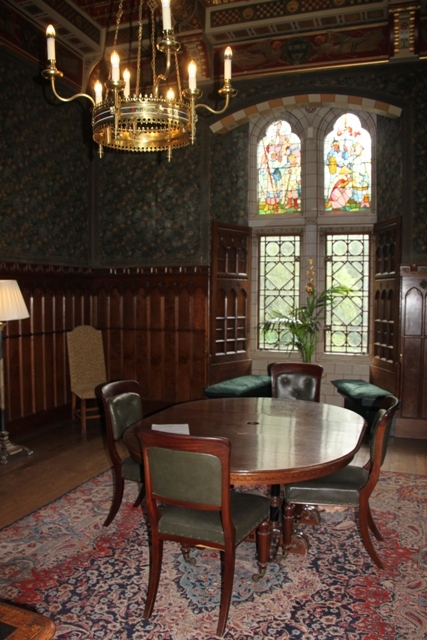 We started in the Winter Smoking Room in the clocktower, saw the Bute children’s nursery with fairy tale paintings covering the walls and entered Lord Bute’s boudoir. How he ever got a wink of sleep in there with all that detail going on in the tiniest bed ever is beyond me. There was a Roman roof garden and the most amazing banqueting hall with heraldic shields, an incredible fireplace and a minstrel’s gallery. This is where royalty and important people are still entertained when they come to Cardiff. The Bute family’s “small” dining room, used when no guests were visiting, had a table with a hole in the centre – designed so a living vine could be slotted through it, allowing diners to pluck fresh grapes as they ate. We finished in the incredible library with our tour guide and were encouraged to retrace our steps if we wanted to view the rooms again at our leisure. That we did. Tour complete we went back outside and with our trusty hand-held audio guides explored the grounds. Lovely views, dare I say though that the stadium (home of beloved Welsh rugby) looks like it is right on top of the castle and does not enhance the panorama. 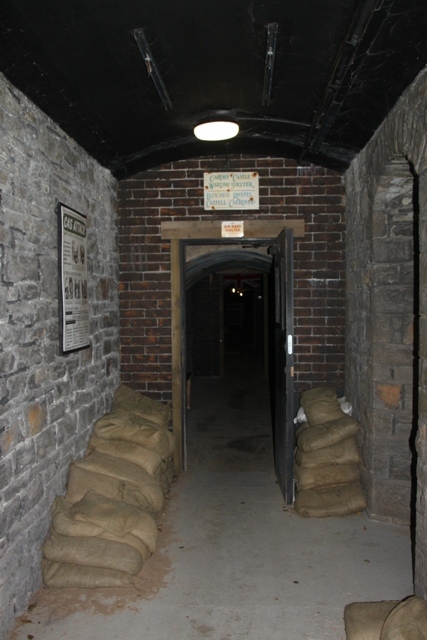 We climbed multiple steps to the keep, walked the walls and found the network of tunnels where, during the air raids of World War II two thousand people from the city were able to take shelter. Sound effects played as we walked through – eerie but incredible. There really is something for everyone here. 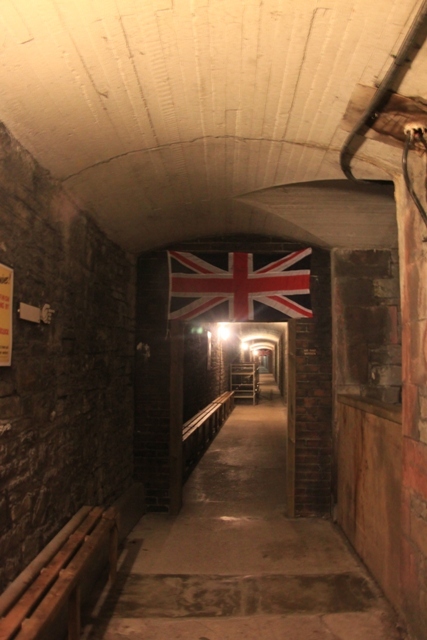 Stacks of history, the most fabulously flamboyant and lavish castle interior, gorgeous grounds with oodles of space to run around, castle ramparts and to top it all some original air-raid shelters. We were so surprised how much there was to see and do – what a great day out. Never been to Wales. The castle looks beautiful. Life from a fairty tale. It is beautiful and full of things to see that are so interesting. I wasn’t quite expecting all that – we had such a great day out here. It looks like a very well preserved castle ! It definitely is, well preserved with so much interesting stuff to see and do – a great day out! Yes, it’s a great place to visit. I’ve never been to Cardiff. The castle looks really fascinating. I had no idea the Butes owned it. They really did just own everything, everywhere. I love that detail of the table with the living grape vines in its centre. Furniture only the really wealthy would ever need. Great photos. 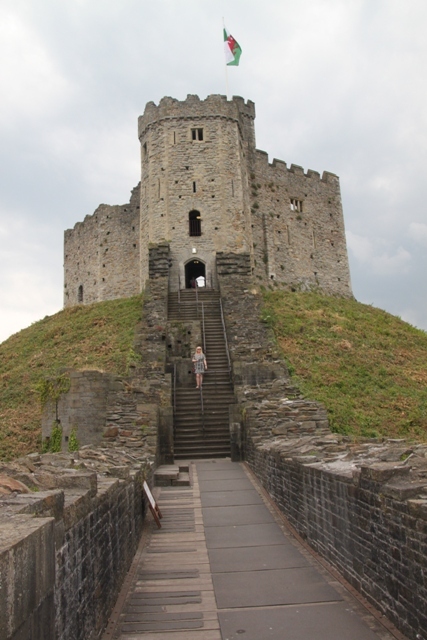 I was really surprised at how much I loved Cardiff – and this castle!! We’d tagged along on a work trip and although normally I research the life out of every trip, we just winged it here, planned to visit the castle but didn’t really know what to expect and were blown away! The Butes only spent a few weeks here every year apparently – too many other places to choose from!! The life of the leisured classes, eh! Looks fascinating, I’ve never been top Cardiff but the architecture looks absolutely stunning. We loved it there – the castle was fascinating and they have loads of interesting shopping arcades – definitely a city I would go back to!! Wow, when I got up this morning I never knew I was going on a castle tour. Photos and comments are all well done. Thank you for coming along!! Great castle isn’t it!! 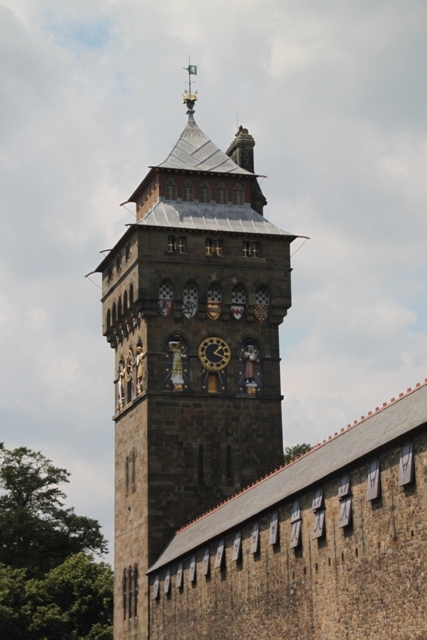 Despite having been born and bred in South Wales I’ve yet to visit Cardiff Castle! Will put that to rights this year after your wonderful write up. We had such a great day out here – I definitely recommend it, so much to see and do and it’s all completely fascinating, the interior is just amazing. Always the way too – things familiar and close tend to be bottom of the list for days out!! It is fascinating! I’ve got to add this to my bucket list! It’s so well preserved as well! It is incredible – so much to see and do, history from all different eras and just a special day out – we loved it!! It is wonderful – those interiors completely blew me away, I’ve never seen anything quite like that before. It is really well preserved and a bit of a mixture, some ruins but some incredibly intact parts. I’ve been to one castle in Ireland – in the north near the Giants Causeway and it was completely ruined – still romantic and mesmerizing though!! Looking forward to reading about your trip. Such a sad story about your father-in-law Rosemary – I can see you must have some bittersweet memories of Cardiff. It is a great castle and definitely worth exploring when you have enough time. We had such a wonderful day out, there is something for everyone, but my favourite part had to be the interior – just incredible and the guide who took us around was superb too. Hope your week goes well too!! Thank you – it’s a beautiful (and unusual!) castle. 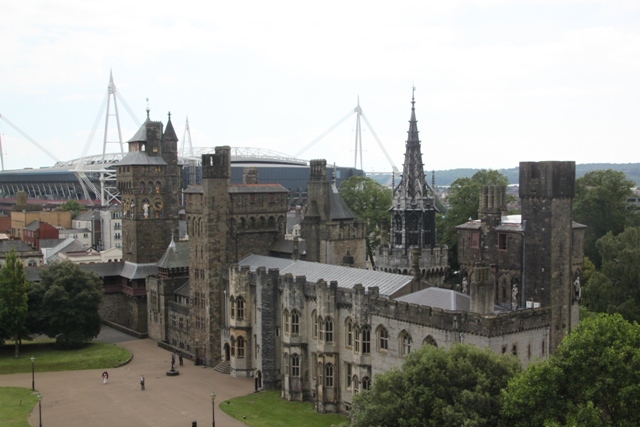 I’d been to the north before as well Suzanne but this was my first trip to Cardiff – I was really impressed. 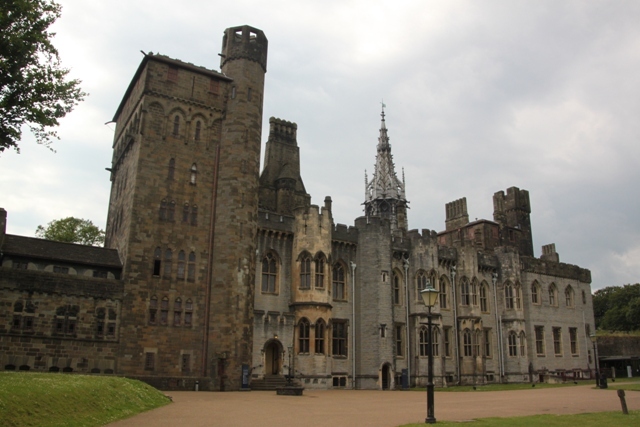 The castle is quite different to those I’d visited in north Wales, we had such a great day out, so much to see and do! This is an amazing place to visit. Your pictures are spectacular and the photo of the stairs reminded me how steep they were when we were climbing down them (with a 2 year old in arms). Yikes! I didn’t know about the WWII connection. That was very interesting and I think we might have to go back to experience it. 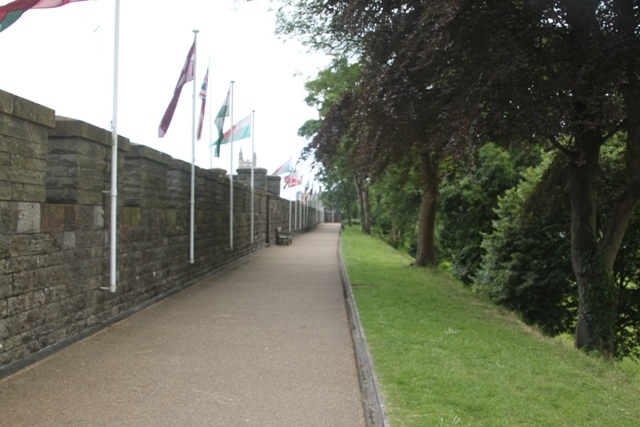 We loved Cardiff and walking around the park that is near to the castle. Great post! We had a great day out there Kirsten – totally agree, it is an amazing place to visit. All credit for making it down (and up!!) those steps with a little one – tough going just by yourself!! 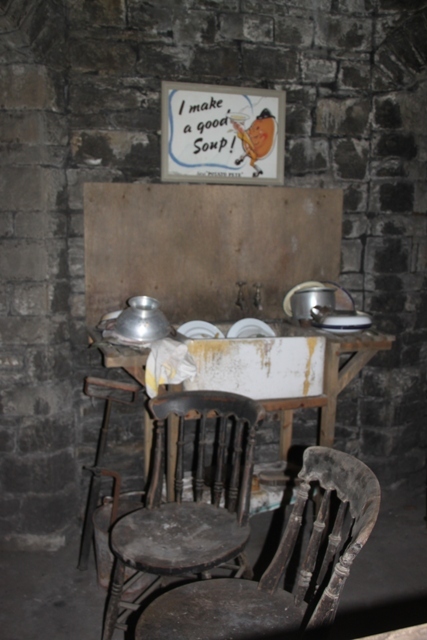 The air raid shelters are easily missed – we were the only people there but definitely worth seeking out if you’re ever back there. Did you go there recently? The grass is so green! The place looks adorable, thanks for the tour! We went last summer – happy memories of sunshine (and green grass!!). Takes me this long to get my photos sorted!! Completely agree Melissa – how were they allowed to build it right on top of the castle!! The goat still makes me laugh. 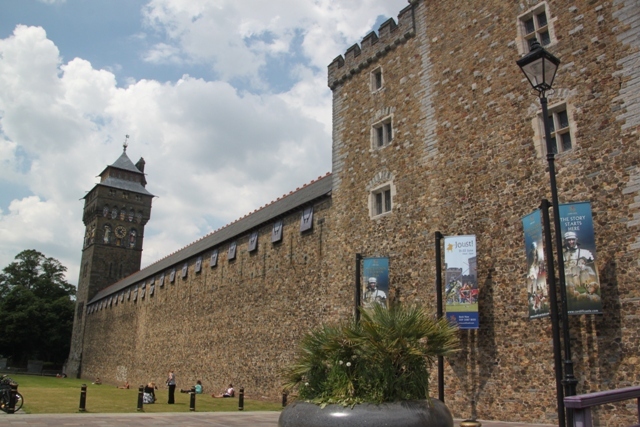 We loved visiting the castle on a day in Cardiff, too! It’s a great city and I wish we had spent more time there. Thanks for sharing your visit! 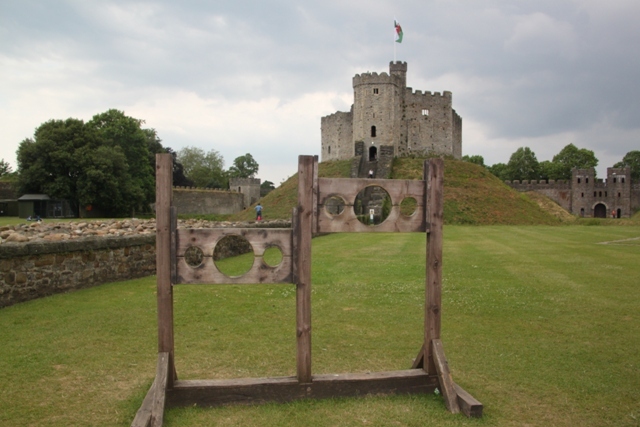 I was surprised just how much there was to see and do at the castle – such varied history – a trip back to Cardiff is definitely on our plans!! What a find, Joy! 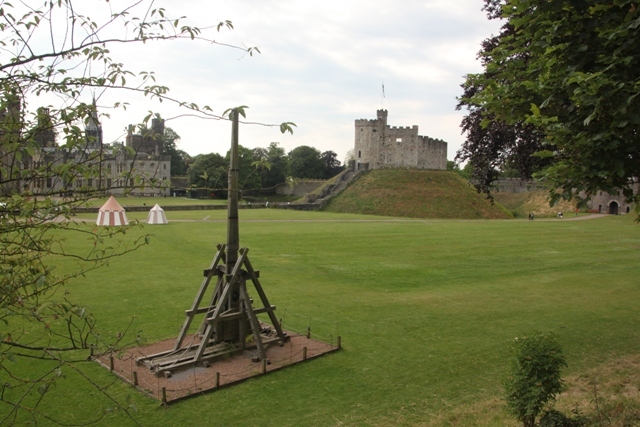 🙂 I’ve never been to Cardiff either, but if I ever do I’ll make a beeline for the castle. Definitely Jo – we were so surprised that there was such a lot to see and do. 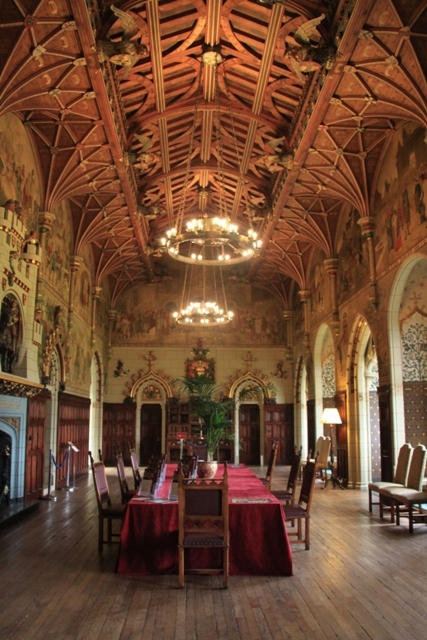 This is no ordinary castle and those interiors are incredible! !